Spaceflight Now has posted a gallery of images from the testing of the Falcon 9 launch vehicle that will launch a Dragon supply craft to the ISS in October. I’m struck by the simplicity of the process, with the launch stand and gantry built right onto the platform that moves the rocket to the launch pad. 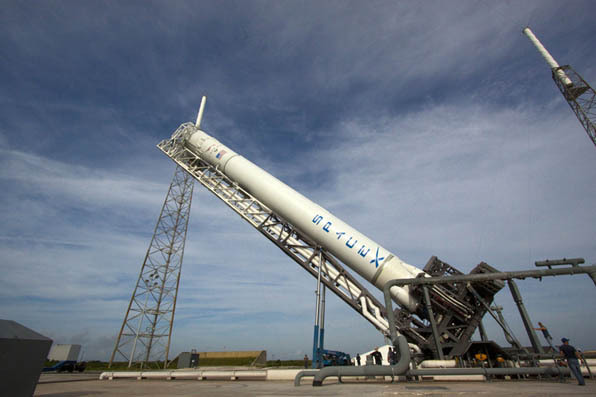 Take a look at how the SpaceX folks have pared this device down to its absolute essentials. As I’ve noted before, they learned a lot from the Russians, as has ULA. 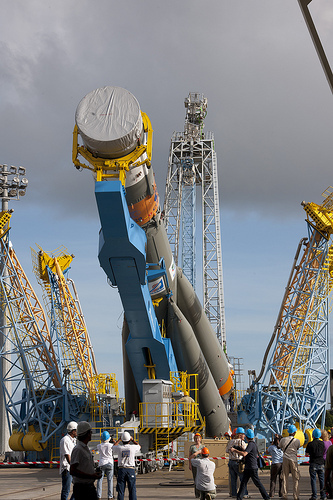 The new Soyuz launch erector device built at the ESA launch station in French Guiana. A gallery of images from the prep for the first launch of a Soyuz from the ESA installation can be found here. This is the kind of thing that cuts down on costs, both development and operations. I’ve been one of those who have been hollering for years about commercial space using “off the shelf hardware,” but I have been impressed how SpaceX has started from a clean sheet on a lot of stuff, like the Merlin engine. They certainly did their homework! I’m looking forward to the launch in October! You are currently browsing the The Old Gray Cat blog archives for the day Wednesday, September 5th, 2012.